In late winter when it may feel like winter will never end, the early blooms of hellebores can remind us that spring is just around the corner. Depending on location and variety, these blooms can persist well into the summer. However, their nodding habit can make them barely noticeable in a shade garden full of other outstanding colorful blooms. That’s why hellebore breeders have created newer, showier double flowered hellebore varieties. Continue reading to learn about growing a double hellebore. Also known as Lenten Rose or Christmas Rose, hellebores are early blooming perennials for zones 4-9. Their nodding flowers are oftentimes one of the first plants in the garden to start blooming and their foliage may be semi evergreen to evergreen in most climates. Because of their coarse, serrated foliage and waxy blooms, hellebores are rarely eaten by deer or rabbits. Hellebores grow best in part to full shade. They especially need to be protected from the afternoon sun. They will naturalize and spread when grown in the proper location and are drought tolerant once established. Hellebore blooms are a delight to see in late winter to early spring when, in some places, clumps of snow and ice still linger in the garden. However, when the rest of the garden is in full bloom, hellebore flowers can seem inconspicuous. Some original varieties of hellebore only bloom for a short time in late winter and early spring. Double flowering hellebores remain showy and have a longer bloom time than single flowering hellebores, but require the same minimal care. 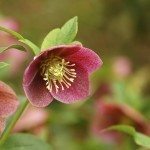 This means that for those interested in knowing how to grow a double hellebore plant, it’s no different than growing any other hellebore variety. Another popular double hellebore series is the Mardi Gras Series, created by plant breeder, Charles Price. This series has flowers that are larger than other hellebore blooms. Also popular in double flowering hellebores is the Fluffy Ruffles Series, which includes the varieties ‘Showtime Ruffles,’ which has double maroon blooms with light pink edges, and ‘Ballerina Ruffles,’ which has light pink blooms and dark pink to red speckles. ‘Kingston Cardinal,’ with double mauve flowers.